What Else Can I Expect From an Online Master's in Theology Program? If your calling lies in the church or ministry, an online master's in theology can help turn your faith into a fulfilling career. In a master's in theology online program, you will immerse yourself in scripture and theological research to further expand your Christian worldview. Graduates with a master's in theology are prepared for ministerial work as pastors or parish leaders and educator positions at all levels. Read more here..
DO I NEED AN UNDERGRADUATE IN THEOLOGY TO SEEK A MASTER'S IN THEOLOGY? Admission requirements vary between schools. Some require students to hold a seminary-related undergraduate degree, while others require them to have any bachelor's. For more accurate information, learners should contact their prospective schools. Read more here..
HOW MANY CREDITS ARE NEEDED FOR A MASTER'S IN THEOLOGY? Credit requirements will vary between program, but will usually be between 30 and 50 credits. For more accurate information, students should check with their prospective schools. Read more here..
HOW MUCH DO THEOLOGY PROFESSORS EARN WITH A MASTER'S DEGREE? The Bureau of Labor Statistics estimated that in 2017, religion teachers earned a median salary of $69,590. Read more here..
IS A MASTER'S IN DIVINITY THE SAME AS A MASTER'S IN THEOLOGY? A master's divinity is considered the minimum degree to assume pastoral roles. The master's of theology is most commonly used as a stepping stone to move into a Ph.D.. program in theology. Earning a master's in theology can reduce the credit requirements of a Ph.D.. program. Read more here.. Upon completion, you will have the experience and knowledge needed to lead others and spread the word of God. Read on to learn more about the skills you will develop in an advanced program and the career opportunities that await you with an online master's in theology degree. Most graduates with a theology master's find employment in the church as pastors or parish leaders, but can also find gainful employment at elementary and secondary schools, and universities. WILL AN ONLINE MASTER'S IN THEOLOGY PROVIDE ME WITH THE SKILLS I NEED TO ADVANCE MY CAREER? A master of theology is a higher degree by research, so graduates of an online program will gain advanced skills in evaluating, analyzing, and disseminating intensive research. In a master of theology online program, you can also enhance your expertise within a specific interdisciplinary area by choosing a specialization; some options include biblical and historical studies, religion and science, or global studies. After completing the program, you will be eligible for several ministry-related leadership careers requiring a graduate degree, including roles as missionaries, pastors, or postsecondary teachers. WILL A MASTER'S IN THEOLOGY ONLINE PROGRAM WORK WITH MY SCHEDULE? Master's in theology online programs are designed to be flexible, and are ideal for working professionals, parents, or anyone else with life commitments that may prevent them from commuting to and from campus on a daily basis. Distance learning allows you to focus on your calling without uprooting your job or family; you will earn your degree from the same esteemed faculty who teach on campus, and from the comfort of your own home. If you are required to complete an internship, you are encouraged to connect with an online program coordinator to find a site that is close to your home for further convenience. Master's in theology online graduates are set to become leaders within the church and the community. Common careers for master of theology students include positions as denominational leaders, mission services directors, and professors at postsecondary institutions, among others. A master's degree will also set you on the academic path to earn a PhD in the field, opening the door to even more advanced roles in the church. WHAT ARE THE BEST MASTER OF THEOLOGY ONLINE PROGRAMS? Choosing an online master of theology program is an extremely personal decision, and only you can evaluate whether a school's teaching approach, available specializations, and course outcomes will help you match your academic and professional goals. The following ranked list of schools is meant to serve as a starting point in your search for the best online master's in theology programs throughout the U.S. We weigh criteria such as school graduation rates, career support services, and course offerings to determine academic excellence. Be sure to contact admission specialists at your target school to learn more about specific requirements and opportunities. Founded in 1923, CIU in Columbia, South Carolina, began as a Bible school that offered evening classes to the general public. CIU currently offers more than 1,000 students 24 undergraduate, graduate, and seminary programs. Learners enjoy an average class size of 20 with a 17-to-1 student-to-faculty ratio. The school's online programs are designed to meet the needs of working adults, including an online master of arts in theological studies degree. CIU’s master’s in theological studies program includes interdisciplinary coursework that emphasizes biblical studies, intercultural knowledge, church history, and theological understanding. Students gain the competencies to advance their ministerial, missionary, or educational careers. The master’s in theological studies program offers two tracks. Students without previous Bible or theological coursework complete coursework in systematic theology, hermeneutics, and specific books of the Bible, while individuals with at least 30 credit hours of Bible, theology, or Church history enroll in elective classes that meet their interests and goals. The former includes 48 credits, while the latter comprises 36 credits. All students take worldview and spiritual formation classes to understand the foundations of spirituality and cultural perspectives as they relate to Old and New Testament theology. Learners also complete a Bible and theology integrative seminar to demonstrate their abilities to analyze, interpret, and evaluate biblical doctrine and theology. To apply to CIU’s master’s in theology online, learners must submit a reference from a church leader, a signed doctrinal statement, and an essay. Students can complete the degree in 18-24 months. Based in Clarks Summit, Pennsylvania, CSU embraces its Baptist foundations by providing undergraduate, graduate, and seminary programs based on a Christian worldview. CSU’s almost 1,000 students complete degrees on the institution’s 111-acre campus or online. CSU holds accreditation through the Middle States Commission on Higher Education. CSU offers an online master of arts degree with an emphasis on biblical apologetics. Learners can complete 30 credit hours of coursework in two years. Required courses in personal evangelism, apologetics, developing a biblical worldview, and leadership strategies accompany elective classes in topics including biblical archaeology, world religions, and contemporary theological issues. The school also offers online master of ministry and divinity degrees to learners who seek to advance their ministry practice. The online master of ministry includes 30 credits of coursework in Bible and theology, practical theology, preaching and communication, and evangelism. Students can concentrate their master of ministry curriculum on organizational leadership, adding classes on leading in ministry environments, strategic thinking for ministry leaders, and risk management for ministry organizations. The organizational leadership concentration also includes an internship or field experience requirement. CSU’s master of divinity degree incorporates 94 credits of interdisciplinary coursework to build communication, leadership, and ministerial skills. In addition to 76 credits of classes, students take an 18-credit, full-time internship at a local church or approved religious setting. Students complete the internship over a full year, completing the program in four years. Initially a Christian workers' school, LCU transitioned to a training ground for Christians in all vocations. LCU equips Christians to serve in the church through educational programs based on a Christian worldview. Founded in 1944, LCU added a graduate school in 1952 and currently offers undergraduate and graduate programs to almost 1,000 students. Online degrees at LCU include an associate degree in the Bible; bachelor’s degrees in business administration, Christian ministry, and psychology; and master’s degrees in organizational leadership and the Bible and theology. Students in the online master of arts in Bible and theology program complete 12 courses in two years. The program builds an understanding of the Bible and a Christian worldview applicable to personal and professional contexts. Students become leaders well-versed in God’s word. Classes in the Old and New Testament and an introductory course in Christian theology prepare students to identify, understand, and apply biblical beliefs and texts. Christian worldview studies classes train learners to engage with cultural understandings of the Bible while analyzing how the Christian faith and scripture apply to non-Christian perspectives. Students gain research, methodological, and analytical skills as they train to interpret the Bible in preparation for a capstone paper or project requirement. Students complete a research paper on an approved topic or participate in a field-based project at an approved site. Applicants submit an essay and two Christian character references for consideration. LCU maintains accreditation through the Higher Learning Commission and the Association of Biblical Higher Education. Steeped in the Jesuit tradition, SCU in Santa Clara, California traces its origins to 1851. SGU became the first Catholic coeducational university in California in 1961 and currently enrolls more than 9,000 undergraduate and graduate learners. Students on SCU’s main campus in Silicon Valley and online participate in over 50 programs, including an online master’s degree in theology. Offered through the Jesuit School of Theology, SCU’s 48-credit online master of theological studies program builds a theological understanding of the Roman Catholic tradition. Students develop scriptural literacy and explore the history and ethics of Catholic doctrine through 39 credits of general theology classes. Learners study historical and systematic theology; ethics, religion, and society; and spiritual and pastoral theology. Nine hours of electives allow students to align the curriculum with their interests. The program also includes a seminar during which students synthesize degree content and produce a research paper or comparable project. Learners work closely with a faculty member on their paper or project, first submitting a proposal and gaining approval from the Jesuit School of Theology associate dean. Students can complete the program in four semesters. Applicants to SCU’s online master of theology program need a bachelor’s degree with a minimum cumulative GPA of 3.0. Learners also need a background in theology, religious studies, or a comparable field and at least one year of active ministry experience. Located in Irving, Texas, UD opened its doors in 1956. UD currently offers undergraduate and graduate programs to over 2,500 learners, boasting an 11-to-1 student-to-faculty ratio. UD maintains accreditation through the Southern Association of Colleges and Schools and is one of 23 Catholic universities in the U.S. with a Phi Beta Kappa chapter. The Neuhoff School of Ministry at UD offers online master’s degrees in Catholic school leadership, catechetical ministry, pastoral ministry, and theological studies. The online master of theological studies includes 37 credits of core and elective classes. Core coursework in liturgy and sacraments, moral theology, church history, and theological reflection build a foundational understanding of Catholic doctrine and the Catholic church applicable to ministry professions and personal Christian communal experiences. Students complete elective coursework in topics including pastoral administration, liturgical leadership, and models of catechesis. Learners can also take elective classes through the College of Business and the Braniff Graduate School of Liberal Arts to pursue individual interests and goals. The online master of theological studies includes an optional biblical theology concentration for students who want to focus on scripture. Learners complete 12 scripture elective courses, including study of the Old and New Testaments. The program concludes with an annotated bibliography that learners prepare to solidify and demonstrate degree competencies. Students create a formal bibliography with more than 25 approved texts, providing a description of the thesis, argument, and significance of each. Established in 1841, Fordham University currently enrolls more than 16,000 students, offering undergraduate and graduate programs from its main campus in the Bronx, at locations in Manhattan and West Harrison, and online. Online master’s degrees at Fordham include masters of arts in pastoral care; pastoral studies; religious education, youth, and young adult ministry; and Christian spirituality. The online master’s in Christian spirituality trains students for general ministerial positions, educational careers, and spiritual direction professions. Students complete 36 credits on the foundations of scripture, theology, and spirituality to gain a holistic understanding of the Christian faith. Classes in the online master’s in Christian spirituality program emphasize methods and history of Christian spirituality, the Old and New Testaments, and the Christian tradition. Students in the general concentration complete classes in theological anthropology, Christology, sacramental spirituality, and ecclesiology alongside electives in spirituality. The online program also features a research concentration for students who want to pursue doctoral study or careers in higher education. The research curriculum incorporates a language requirement and a thesis. A third option, the spiritual direction concentration, trains students in counseling theory and pastoral counseling skills. Spiritual concentration learners also complete two practica within a counseling practice. Some spiritual direction classes include on-campus residencies or retreat requirements. All students take comprehensive exams at the end of their degree. Applicants submit a personal statement, resume, two letters of recommendation, and participate in an interview. Fordham holds accreditation from the Middle States Association of the Commission of Higher Education. Calvary grew out of the merger of Kansas City Bible College and Midwest Bible College in 1961 and the subsequent consolidation with Citadel Bible College in 1987. Calvary provides academic programs built on the doctrinal traditions of all three entities from its main campus in Kansas City, Missouri; locations in Fort Morgan, Colorado, and Warrenton, Missouri; and online. Through Calvary’s seminary, students can earn an online masters of arts degree in Bible and theology or biblical counseling. The online master’s in Bible and theology includes 36 credits that learners can complete in one year. Learners study the New and Old Testaments, systematic theology, biblical philosophy, biblical languages, and research methods to gain foundational theological knowledge applicable to a life of service. Calvary’s online master’s in biblical counseling comprises 54 credits to build practical theological competencies and biblical counseling skills applicable to the church and community settings. Learners study Bible and theology core classes before focusing on biblical counseling classes. Courses in human growth and development, theological foundations of counseling, and counseling theories prepare students for a counseling internship. Calvary also offers a 90-credit online master of divinity program. Students explore scripture, linguistics, and hermeneutics in preparation for educational and leadership roles in the ministry. Learners focus on pastoral studies through classes on expository preaching, practice of church ministry, and theology of church ministry. Applicants submit a pastoral reference and a personal reference with their resume, transcripts, and proof of identity. Calvary holds accreditation through the Higher Learning Commission and the Commission on Accreditation of the Association for Biblical Higher Education. DBU offers almost 80 undergraduate and more than 30 graduate programs from its main Dallas location and online. Originally founded in Decatur, Texas, in 1898 as the first junior college in the state, DBU prepares students to serve as Christian leaders in their personal and professional lives. DBU maintains accreditation through the Southern Association of Colleges and Schools Commission. Online master’s degrees at DBU include a master of arts in children’s ministry. Learners complete a general curriculum or concentrate on working with special needs children. Through 36 credits, students take core classes in systematic theology, biblical servant leadership, and Christian history and heritage alongside coursework in children and the Christian faith, and ministry with children. DBU also offers an online master of arts in Christian ministry. The program includes 10 specializations, such as ministry leadership, professional life coaching, and urban ministry. DBU’s online family ministry and discipleship programs prepare students to develop Christian foundations as they work with individuals, groups, and communities. The family ministry degree includes tracks for learners who want to focus on Christian counseling or special needs families. DBU offers an additional online master of arts degree in student ministry for learners who want to hone knowledge and skills applicable to a Christian school, youth mission, campus ministry, or curriculum development career. All curricula incorporate 36 credits of core and concentration coursework. Applicants submit two references, a statement of purpose, resume, and transcript information. Initially associated with the Bible Institute of Los Angeles, Biola opened its doors in 1908. Biola’s Talbot Theological Seminary launched in 1952 to expand the institution’s theology, education, music, and missionary medicine degrees. Biola moved to its current La Mirada location in 1959 and currently houses nine academic schools. Biola holds accreditation through the Western Association of Schools and Colleges and the Association of Theological Schools. Through its Talbot Theological Seminary, Biola offers a hybrid master of divinity degree. The program prepares students to analyze, interpret, and share Christian doctrine as educators and ministry leaders. Students gain the theological knowledge and skills needed for ordination. Learners can complete 79 credits in three to five years. Students can choose one of six concentrations: evangelism and discipleship; Messianic Jewish studies; missions and intercultural studies; pastoral and general ministries; pastoral care and counseling; or spiritual formation. All students complete spiritual formation core classes in personal foundations for spiritual formation; spiritual direction; and spiritual formation, vocation, and the disciplines. Talbot Theological Seminary also offers online masters of arts degrees in Bible exposition, New Testament, Old Testament, and theology. The Bible exposition program emphasizes teaching scripture, while the New and Old Testament curricula focus on an exegesis of individual books of the Bible. The online master’s in theology provides general theological knowledge with a degree track in Greek. Applicants submit a pastoral and character reference, Christian testimony, vocational essay, and transcript information. ASOT began as the Apex School of Religion in 1995. From its current Research Triangle location in Durham, North Carolina, ASOT provides undergraduate and graduate degrees in Christian education, theology, counseling, and ministry. ASOT also offers lifelong learning, independent study, and continuing education programs. The interdenominational and inclusive institution promotes cultural diversity, spiritual responsibility, and religious leadership. ASOT incorporates African American culture into its academic programs and community. 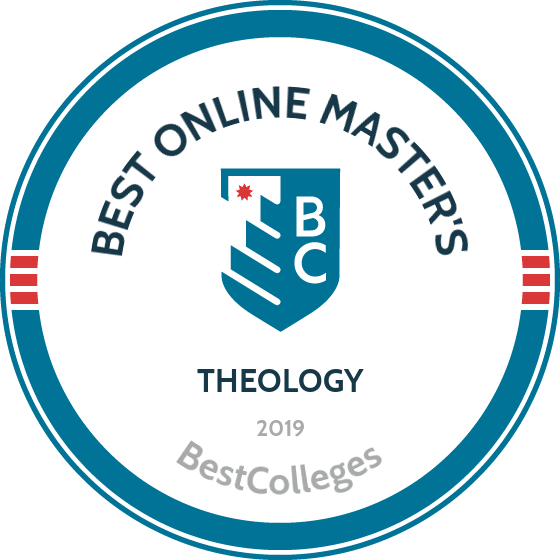 The online master of divinity at ASOT includes 90 credits of coursework in the Old and New Testaments, biblical Hebrew and Greek, biblical narratives and storytelling, history of Christian thought, and Christian ethics. Students also complete classes on theological foundations of forgiveness and reconciliation, the love of learning and the desire for God, and pastoral care and theology of the soul. Learners can complete elective courses in the church and elder care, women in ministry, and professional and legal ethics of church counseling. Applicants to ASOT’s online master of divinity program submit a personal spiritual autobiography, two letters of recommendation, and transcript information. Individuals who do not meet admission requirements may receive consideration for life experience and demonstrable ability to benefit from ASOT’s programs. ASOT holds national accreditation through the Transnational Association of Christian Colleges and Schools. Founded in 1971, Liberty began as a small college with just over 150 students. Currently, Liberty offers more than 15,000 learners undergraduate and graduate programs from its residential campus in Lynchburg, Virginia, and online. Liberty maintains accreditation through the Southern Association of Colleges and Schools Commission on Colleges. Liberty offers online master’s degrees in biblical exposition, biblical studies, Christian apologetics, Christian ministry, and pastoral counseling. The online master of arts in pastoral counseling includes 36 credit hours that learners can complete in 18 months. The program prepares learners to apply Christian doctrine and biblical principles to psychology, mental health treatment, and spiritual health. Students enrolled in the pastoral counseling degree study foundational doctrines of pastoral counselors, spiritual formation and crisis intervention in pastoral counseling, and theories and techniques in pastoral counseling. Theology coursework in systematic theology, public theology, and the doctrine of God accompany a pastoral counseling internship. During the pastoral counseling internship, learners work closely with a counseling professional while applying degree knowledge and principles. The online master’s in pastoral counseling allows students to complete two on-campus intensives to enhance practical skills. While the program does not include professional licensure, students develop the competencies to work as pastors, lay ministry leaders, and in other spiritual counseling roles. Students enrolled in the master of arts in pastoral counseling receive discounted tuition for full-time or part-time study. Liberty provides tuition discounts for current and retired military personnel and their families. Veterans who work as first responders receive additional tuition benefits. Learners can transfer up to 50% of credits into the program. With almost 9,000 students, Creighton remains true to its origins by providing academic programs infused with Jesuit principles. Founded in 1878 in Omaha, Nebraska, Creighton boasts an 11-to-1 student-to-faculty ratio. Creighton offers undergraduate and graduate degrees and certificates through nine schools and colleges, including an online master of arts in ministry. The online master’s in ministry curriculum incorporates 46 credits of theology, professional, and personal development coursework. Learners complete accelerated online theology classes in the Old and New Testaments, Christology, ecclesiology, ministerial ethics and leadership skills, and Christian prayer and spirituality. Students also take a historical spiritualities in the Christian tradition hybrid class that requires a short residency each fall. Students participate in an immersive ministry internship to apply religious values and principles in a practical setting. The internship emphasizes fostering one’s calling in a parish community. In conjunction with the internship, learners take a two-credit synthesis in lay ecclesial ministry course that serves as a comprehensive examination project. Learners can enroll in an optional dual degree, completing a master's in negotiation and conflict resolution alongside the master of arts in ministry. The dual degree offers hybrid coursework, combining foundational classes from the negotiation and conflict resolution degree with core ministry courses. Applicants need at least nine previous credits of theology coursework. Students submit three letters of recommendation and a personal statement for consideration. Students enrolled in the master of arts in ministry degree receive a 50% tuition remission. Creighton holds accreditation through the Higher Learning Commission. Based on a 90-acre campus in Nampa, Idaho, NNU provides academic programs that combine educational excellence with Church of the Nazarene values. Through four academic schools and colleges, NNU offers more than 60 areas of study, including online master’s degrees in pastoral ministry; youth, children, and family ministry; and divinity. NNUs online master of arts in pastoral counseling includes 40 credits that learners can complete in 28 months. Students study Christian education, pastoral leadership, preaching and worship, and spiritual and personal formation. During two supervised ministry classes, students work with a ministry mentor to apply degree knowledge and skills in preaching, counseling, and teaching. The online master of arts in youth, children, and family ministry comprises 36 credits, while the online master of divinity with a youth, children, and family concentration comprises 74 credits. The master of arts in youth, children, and family ministry emphasizes using the Bible to address issues related to faith of young persons, families, and communities. Learners complete coursework in ministerial leadership, missional ministry, family ministry in practice, and developmental and spiritual formation for young populations. The master of divinity degree with a concentration in youth, children, and family builds on the core coursework of the master of arts degree. Through 39 additional credits of advanced theological classes, divinity students study biblical exegesis, missiology and contextualization, and preaching and worship. Students can complete the degree in just over four years. NNU’s online master’s degrees feature a cohort model, allowing students to enter and progress through the curriculum as a group. Based in Virginia Beach, Virgina, Regent provides undergraduate and graduate programs through seven schools and two colleges. Founded in 1978 by televangelist Pat Robertson, Regent trains men and women to represent Christ in their personal and professional lives. Regent’s online and on-campus educational degrees combine academics with a Christian worldview. Regent’s school of divinity offers a 48-credit online master of theological studies degree with four concentrations. Students following the biblical studies concentration develop biblical interpretation skills and an advanced understanding of Old and New Testament theology. Learners prepare for future theological research and writing, careers in the pastorate, or continued graduate study. Alternatively, the biblical language concentration emphasizes Hebrew and Greek and focuses on exegesis and interpretation for ministerial teaching and leadership. The online master of theological studies program also offers a specialization in Christian theology. Coursework emphasizes theological and philosophical understanding through in-depth study of Christology, apologetics, and biblical texts. It also discusses the application of Christian principles to ministerial and educational contexts. Finally, the concentration in church history focuses on the early development of the Christian church, renewals and reformations over time, and the formation of Christian doctrine as it applies to the contemporary world. Applicants to this online master of theological studies program must submit a personal goals statement, accept Regent’s statement of faith, and provide transcript information demonstrating a minimum undergraduate GPA of 2.75. Regent holds accreditation from the Southern Association of Colleges and Schools, and its school of divinity is accredited by the Association of Theological Schools in the United States and Canada. In 1946, the bishop of Steubenville, Ohio, founded Franciscan. Under the leadership of the Third Order Regular of St. Francis of Penance, Franciscan offers undergraduate and graduate programs to 3,000 students from its 249-acre campus and online. Franciscan's teachings are based in the Catholic faith and tradition, and the school trains students to embrace and apply their dedication to Christ in their personal, vocational, and spiritual lives. Franciscan’s online master’s degrees include a master of Catholic leadership, a master’s in catechetics and evangelism, and a master’s in theology and Christian ministry. The school's online master of arts in theology and Christian ministry includes core classes in the principles of biblical study, theology of Christ and the church, moral theology, and dogmatic theology. Students can also complete specializations in catechetics, canon law, or research. The catechetics concentration prepares learners to teach in a parish, diocese, or comparable religious setting. Classes in catechetical methods, the rite of Christian initiation, and contemporary catechetical practice are followed by a catechetical practicum. During this practicum, learners work under the supervision of a parish adult educator or Catholic school teacher to gain hands-on teaching experience. The canon law concentration introduces students to church laws and regulations that govern the Catholic church. Alternatively, the specialization in research prepares learners for doctoral study through intensive coursework in historical, systematic, and biblical theology. Learners gain the skills needed to conduct thesis work, write peer-reviewed publications, and give presentations at academic conferences. Students develop theological research and writing skills while studying one classical and one contemporary foreign language. Franciscan holds accreditation from the Higher Learning Commission and approval from the Ohio Department of Higher Education. With origins dating to 1944, FPU provides undergraduate, graduate, and seminary programs from its main campus in South Fresno, California; regional campuses in North Fresno, Visalia, Bakersfield, and Merced; and online. FPU’s seminary, founded by a mandate from the North American Mennonite Brethren Churches, opened its doors in 1955. Currently, Fresno Pacific Biblical Seminary houses three training centers and offers an online master of arts in ministry, leadership, and culture. The online master’s in ministry, leadership, and culture degree at FPU includes 48 credits of coursework and targets current pastors and ministers who want to advance their practice. The three-year degree incorporates biblical and theological reflection courses, as well as personal and holistic formation classes. Learners also study radical and practical application courses in collaborative leadership, communities of mercy, and conflict and peacemaking. Graduates build communication and analytical skills for effective outreach and disciple-making in global and local contexts. Students also complete a self-directed, cross-cultural experiential class and a creative capstone project. During this program, learners participate in 90-minute synchronous discussions every week. Students must also serve their local churches for 10 hours each week and attend four one-week retreats. Applicants interested in this online degree in ministry, leadership, and culture should submit a personal profile statement, three letters of recommendation, and a writing sample. FPU holds accreditation from the Western Association of Schools and Colleges. The school's seminary maintains accreditation from the Association of Theological Schools in the United States and Canada. Based in Southlake, Texas, TKU has partnered with the Gateway Church since 2009. Currently, the university offers 16 vocational ministry degrees, including online undergraduate and graduate programs in Christian ministry, worship leadership, practical theology, and divinity. TKU’s online master of practical theology degree prepares graduates for careers in local churches, church organizations, and larger community settings. Students explore ministry theories and develop practical skills, while also building an advanced biblical and theological understanding. This 48-credit degree includes nine credits in Old and New Testament theology and current issues in biblical interpretation, as well as 12 theological or historical studies credits in Christian theology and history. Learners also complete 18 credits of practical ministry in leadership, preaching, and practice and six credits of electives. The program includes a graduate ministry practicum and an accompanying capstone project. The online master of divinity program at TKU prepares effective servant leaders by developing students' biblical and theological knowledge. Graduates often pursue careers as ministers, missionaries, and church organization professionals. Applicants to TKU’s online master’s programs must demonstrate a cumulative undergraduate GPA of 2.5 or higher. All master of divinity students complete a graduate Bible assessment upon admission and attend an introductory workshop on the Old and New Testaments and biblical interpretation. TKU holds accreditation from the Transnational Association of Christian Colleges and Schools and the Association for Biblical Higher Education. With four campuses in the greater Chicago area, Loyola is one of the largest Jesuit institutions of higher education in the United States. Through its 13 schools, colleges, and institutes, Loyola provides more than 17,000 students with undergraduate, graduate, and professional programs rooted in the Jesuit tradition. Online programs at Loyola include a master of arts in pastoral studies and a master of divinity. Offered through the school's institute of pastoral studies, the MA in pastoral studies includes 36 credits that train graduates for ministerial roles. Learners study scripture, pastoral theology, and ministry leadership. Available degree concentrations include church management, healthcare ministries, religious education, and youth ministry. Students also complete a supervised practicum in a ministry setting and one on-campus intensive. The online master of divinity program at Loyola prepares individuals for full-time pastoral ministry careers. Students complete 72 credits from three curriculum components. Academic coursework develops a critical understanding through classes in scripture, systematic theology, Christian living, and ethics. Additionally, a ministerial practice develops learners' liturgical and pastoral leadership. The final component of the curriculum places students in a practical setting to gain hands-on expertise. Participants learn to apply and assess theology as it relates to community practice and history, daily life, and ministerial response. Students produce a final integration paper at the end of their practicum experience. Loyola holds accreditation from the Higher Learning Commission, and the school's institute of pastoral studies is a current candidate for accreditation from the Association of Theological Schools in the United States and Canada. Founded as Pacific Bible Seminary in 1928, HIU is currently based in Fullerton, California. As one of HIU’s five academic colleges, the Pacific Christian College of Ministry and Biblical Studies offers certificates in biblical language, church planting, general ministry, and spiritual formation. It also awards master’s degrees in church music, divinity, and ministry. The online master of arts in ministry at HIU has eight specializations, and learners can complete a single or dual concentration. Suitable for adult learners interested in a second career at their local church or with a church organization, the master of arts track combines biblical understanding, professional development, and personal spirituality to prepare Christian leaders. Degree specializations, including biblical studies, Christian leadership, and intercultural studies and missions, allow students to tailor the program to match their individual interests and goals. The single-concentration track includes 36 credits with a minimum of nine credits related to concentration coursework. Learners study scriptural and theological development, theological history, Christian ethics and justice, and Christian beliefs and practices, in addition to their specialization classes. Each specialization offers a different emphasis. For example, biblical studies students focus on language, Christian ministry learners develop effective ministry practices, and church planting students explore aspects of church expansion. The dual-concentration option adds an additional nine credits to the program, allowing students to complete coursework in a second specialized area. HIU holds accreditation from the Western Association of Schools and Colleges and maintains membership with the Council for Christian Colleges and Universities. HIU's MA in ministry holds programmatic accreditation from the Association for Biblical Higher Education. With roots tracing to 1871, HCU transitioned from a small Bible college to become the Southeastern Institute of the Bible in 1968. HCU took its current name in 2001 and holds accreditation through the Association for Biblical Higher Education. HCU -- affiliated with the Churches of Christ -- integrates Christian service and missionary training into undergraduate and graduate programs, which it offers online and from its campus in Florence, Alabama. Students in the online master of ministry program at HCU complete 36 credits, including six general studies credits and 12 major-area credits from ministerial counseling, homiletics and ministerial care, history of biblical interpretation and theology, or biblical studies. Students also take six credits in a different major area (to complete a minor) and 12 credits of electives. HCU’s online master of divinity -- offered in conjunction with the Ezell Institute of Biblical Research -- incorporates 75 credits of classes. Learners complete religious heritage classes and explore biblical languages and the Old and New testament. Courses in contextualization emphasize methods of biblical interpretation and biblical ethics, while spiritual formation classes prepare learners for the obligations and expectations of ministerial work. Other classes focus on ministry counseling, conflict resolution, preaching, and congregational health and ministry. At the culmination of the degree, learners participate in a six-credit practicum in ministerial leadership. Applicants must submit three references, standardized test scores, and a personal statement. The personal statement should detail past intellectual and creative achievements and future goals related to graduate study at HCU. Located in Elizabethton, Tennessee, Milligan sits on a 235-acre campus in the northeast region of the state near the Virginia border. Milligan currently offers over 100 fields of study and has trained many learners to serve as Christian leaders. Milligan holds accreditation with the Southern Association of Colleges and Schools and membership with the Council for Christian Colleges and Universities. Graduate and professional programs at Milligan include an online master of arts in Christian ministries. This three-year degree requires 48 credits and is designed to bolster the credentials of current ministry professionals. Learners complete 15 credits in both Christian ministries and biblical studies, 12 credits in church history and Christian theology, and six credits of spiritual formation and mentored ministry experience requirements. During their first year, learners take courses such as personal identity in pastoral care, biblical studies, Christian world missions, and Old and New Testament writings. The second year emphasizes biblical preaching, theology, Christian tradition and mission, biblical exegesis, and curriculum development for teaching. The final year of the program focuses on ministry team dynamics and leadership, Christological principles for ministry, theology of the Old Testament, theological integration, and a mentored ministry experience. Students enter the program in a cohort and develop an intellectual and spiritual relationship with their peers and instructors throughout their course of study. The curriculum also includes one or two on-campus, week-long residencies each year. Learners visit campus a total of five times during the program. Applicants must hold a bachelor’s degree from an accredited institution and provide evidence of contributions to their church. Students also submit a written account describing a critical incident encountered during their personal ministry experience to demonstrate their ability to think independently, communicate clearly, and research effectively. Based in Bourbonnais, Illinois, ONU hosts almost 5,000 learners at its 275-acre campus; at other locations throughout Illinois, Indiana, and Michigan; and online. Established in 1907, ONU offers 140 academic programs through seven schools and one college, each grounded in the theological tradition of the Church of the Nazarene. ONU offers bachelor’s, master’s, and doctoral degrees in ministry, divinity, religion, and ethical leadership. Master of arts programs in religion, pastoral ministry, urban ministry, biblical studies, Christian ministry, and family ministry accompany an online master’s degree in pastoral leadership. The pastoral leadership curriculum combines theory and practice through coursework in theology, ministry, and community leadership. Students can complete the online master’s in pastoral leadership program in two years. The 36-credit degree prepares graduates to work as pastors, chaplains, outreach ministers, or within a church organization recognized by the Church of the Nazarene. Best suited for learners with a strong background in religion and the ministry, this program's curriculum resembles a traditional master of divinity program. Ministry professionals dedicate their lives to the service of God and humanity, gaining an advanced understanding of pastoral responsibilities, effective ministerial methods and techniques, and theological principles. Graduate students at ONU pay for tuition on a per-credit basis. Ministers receive a 25% discount and full-time, part-time, and volunteer staff ministers in the Church of the Nazarene can apply for a 50% tuition reduction through the ONU Minister’s Scholarship. Cedarville has partnered with the Baptist Bible Institute of Cleveland since 1953. Graduate programs at Cedarville include an online master of ministry degree that prepares professionals to serve their local church as a teacher, ministry leader, or lay pastor. The online curriculum emphasizes biblical and practical theology, builds application and leadership skills, and fosters servant and ministerial callings. Students receive advice from mentors and accrue practical experience as they prepare to work in pastor and ministry roles. Learners can complete Cedarville’s 38-credit online master of ministry program in as few as 12 months. The first semester includes classes in biblical care and counseling, Trinitarian implications for practical ministry, contemporary theology, exposition on the New Testament, and Christian apologetics. Coursework during the second semester emphasizes biblical leadership, biblical theology, ministry teaching and preaching, the church and God’s mission, and exposition of the Old Testament. Students also complete a character colloquium and a ministry internship. During the character colloquium, learners meet with the program director to pray and reflect on the ministry and life. The internship allows learners to observe a minister and apply practical theories and techniques in a real setting. Cedarville holds accreditation from the Higher Learning Commission and is certified by the Ohio Department of Higher Education. As the main campus in the Johnson University System, JUTN in Knoxville traces its origins back to 1893. JUTN incorporates arts and sciences, Bible and theology, and professional study into its undergraduate and graduate programs. The school offers more than 70 programs at campuses in Tennessee, central Florida, and online. It also hosts extended education programs at residencies held around the United States. JUTN offers a 24-credit online master of arts degree in the New Testament. The curriculum includes 12 credits of core classes in New Testament theology, history and archaeology of the New Testament, and research methods applicable to studying New Testament texts. Students complete an additional 12 credits in a concentration, such as research, preaching, spiritual formation and leadership, or a customized specialization. The research concentration requires advanced language, translation, and exegesis training in Greek and culminates in a research thesis or project. The preaching specialization focuses on preaching, teaching, and a preaching project. Alternatively, the spiritual formation and leadership emphasis highlights methods, history, and principles of spiritual formation through a final project. Students can also create their own concentration by taking a group of related courses, agreed upon by members of the faculty, and preparing an integrated project or thesis. Some on-campus attendance is required. For example, students in the research and customized specializations must visit the JUTN campus once or twice. Additionally, students in the preaching concentration participate in a preaching emphasis week each spring, while spiritual foundation and leadership students attend two summer classes and a retreat. Applicants to the master’s in New Testament program at JUTN submit three letters of reference and an essay detailing their reasons for pursuing the degree, their current commitments to the church, prior work experience, and career goals as they relate to the program. Founded in Wichita, Kansas, by the Adorers of the Blood of Christ in 1903, NU offers educational programs imbued with Catholic values and traditions while embracing all faiths and beliefs. NU’s 15-to-1 student-to-faculty ratio allows learners to receive individualized attention and mentorship from their instructors while building spiritual and collegial relationships with their peers. NU offers almost 50 undergraduate programs alongside six graduate degrees. Its online master’s programming includes a master of arts in theology and a master of theological studies. The 30-credit online MA in theology prepares graduates for doctoral study through courses in foreign language, biblical theology, moral theology, catechesis, and research methods. At the beginning of each course, students attend an intensive on-campus weekend residency. Students complete a thesis and take comprehensive exams at the conclusion of the program. The online master of theological studies degree at NU prepares students to work as catechists and teachers within the Catholic church. Learners explore Catholic tradition, theology, and heritage, preparing to teach children, youth, and adults alike. The 30-credit curriculum includes coursework in Old and New Testament theology, moral theology, catechesis, and liturgy for the Rite of Christian Initiation of Adults. Similar to the master’s in theology online track, each class begins with an on-campus weekend residency. Applicants to either of NU’s online master’s tracks must submit proof of a bachelor’s degree in theology or a related field (earned with a minimum 3.0 GPA), one letter of recommendation, and an essay articulating theological interests and goals. NU holds accreditation from the Higher Learning Commission. To get the most out of studying your master's in theology online, it's important to find out which program best suits your needs. Details vary depending on the school and program chosen, but the following covers the basics of what you should expect. Coursework can vary between programs. To give you an idea of a typical master's in theology online curriculum, sample courses are listed below. Church history: This course provides foundations in historical, biblical, and theological training, exploring Christianity through different cultures and eras. Historical theology can provide skills useful for teaching, research, and doctoral studies. Spiritual formation: Spiritual formation emphasizes spiritual growth and gaining a deeper understanding of concepts and practices leading to a Christ- and community-centered life. This subject can equip you for a future as a spiritual director or leader of a spiritual formation ministry. Intercultural studies: Intercultural studies, which generally integrate theology with ethics, sociology, and anthropology, develops global leadership skills and appreciation for diversity. These skills can prepare you for work among other ethnic and cultural groups, such as military chaplaincy or diplomatic positions in overseas U.S. embassies. HOW LONG DOES IT TAKE TO GET AN ONLINE MASTER'S IN THEOLOGY? On average, a theology master's program online requires students to earn 34-38 credit hours, and this can be accomplished with about two years of full-time study. Some programs can be completed in 18 months while others take up to four years. This depends on the depth of instruction, the specialization or concentration you choose, whether you study part time or full time, and whether the school offers an accelerated track. There are also variables specific to distance learning to consider as online degrees are presented in various formats. Asynchronous delivery provides flexible, 24/7 access to coursework that you can complete on your own schedule. Synchronous and cohort learning mimic the traditional classroom; all students attend online classes at the same time. Biblical counseling: Gaining online seminary licensure in counseling can open the door to roles in vocational, family, and ministry settings, such as pastors or high school counselors. Some curricula are designed around certifying agencies' requirements so that students automatically graduate with certification. Coursework will qualify you to sit for licensure examinations. Teaching: Agencies such as the Religious Education Department of the Catholic Education Office grant certifications with different requirements for various age levels. A master of divinity online concentration in teaching is usually required to qualify for certification. Proper accreditation is important to the ministry as it demonstrates that you received a quality education – one that meets recognized standards in curricula, faculty, learning resources, and governance. Accreditation also allows you greater flexibility if you pursue education beyond your master's of divinity online, as some institutions won't accept credit from unaccredited schools. Most online seminary schools are accredited by the Association of Theological Schools in the U.S. and Canada, which is recognized by the U.S. Department of Education (DOE) and the Council for Higher Education Accreditation (CHEA). Regional accreditation, compared to national accreditation, is more widely accepted between schools and sought after by employers. The DOE and the CHEA have a strong influence on accreditation. Both oversee the approval of accrediting organizations to ensure they meet strict regulatory criteria, which in turn, ensures the quality of accredited schools. You can find a database of accredited institutions on the the DOE's and the CHEA's websites. Ministerial and theological work is not for everyone. Students blessed with the belief, patience and grace for religious training are a rare breed, and prospective theological students should understand and evaluate the rigors of studying in an advanced program before pursuing an online Master's in Theology. For those called to theology, both the classwork and the career opportunities that await after graduation are incredibly rewarding. Students can expect to deepen their understanding of Christian principles and the Bible. The programs listed above provide exposure to the world's most influential religious texts, while renowned faculty train students to become experts in religious history and cross-cultural ethics. Those programs prepare you for a career in religious-based academia or for life in the ministry, and the school will offer insight into the challenges inherent in providing religious counsel in the modern world. Students also emerge from school prepared to integrate scripture with modern technology in either academia or the church. Most graduates with a theology master's find employment in the church as pastors or parish leaders. Beyond religious organizations, theology degree-holders often find gainful employment within educational institutions, including elementary and secondary schools, colleges, universities and professional learning facilities. Though master's degree-holders are typically eligible for teaching jobs at churches and schools, most colleges require theology professors to hold a doctorate. Obtaining a Bachelor's in theology may help you qualify for an entry-level job, though most theological careers require at least a master's degree. Fortunately, fulfilling positions are increasingly in demand for postsecondary graduates: the BLS projects an employment growth of 8.9% among religious workers between 2012 and 2022 and reports an annual mean wage of $34,700 as of May 2014 for professionals in this occupation, an increase from a reported $31,600 in 2011. While the coursework in any postsecondary program will challenge people of all backgrounds, the online format facilitates efficient instruction while providing sufficient resources for students to succeed. Distance learners have as much access to world-class faculty and a variety of theological subfields as residential students, and the online format is ideal for working professionals to strengthen their bond with Christ without disrupting their professional and familial responsibilities. If a career and a life in theology is your true calling, earning your diploma from one of the best master's degree in theology programs online is the perfect way to get started.